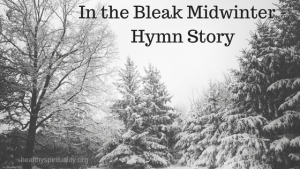 Quick quiz: Do you know the hymn “In the Bleak Midwinter”? This song called to my heart this Advent, so I thought I would explore it. Come along with me. Often when a word, phrase or like this a song resonates in my heart, stirs my spirit, invites me closer – I pay attention. I talk with God about it. I sit quietly, holding the gift in my open hands, listening to its lesson or just enjoying its presence with its Creator. Who Wrote “In the Bleak Midwinter”? Rossetti never married and lived quite independently. She used her poems and words to bring attention to issues of the day, such as slavery, animal experimentations and sexual exploitation of young women. She was often sick and without much money, but devoted her life to her family, her faith, and ministry with former prostitutes. Quite a calling I would say. About 12 years after her death, the words appeared for the first time in The English Hymnal attached to a tune by composer Gustav Hoist. We have sung this hymn basically in the same form since it first appeared in 1906. Take a moment and read the words of this hymn. If you can, read them out loud and prayerfully. Snow in Bethlehem? I don’t know the climate well over there, so at first wondered about the accuracy of this scene. But then I thought poetically about what she was trying to say: Jesus came into a cold, hard, and desolate world with the beauty of calm, peace, and quiet. We all need this during the rush and craziness of the holiday. Those experiencing loss and having a difficult time finding the joy in Christmas, can find hope and comfort in this setting. In the second stanza I am reminded that neither heaven or earth can contain the majesty of our God. He is always More. Yet he still comes and stays in our ordinary lives such as a stable. What love and tenderness rises from the third and foruth verse. That last verse is the one I have heard before and remember the most. No matter what is going on in our lives, how stressed we are, how drained our resources are, how empty we feel – we can still give our hearts. And that is the best gift. What does this hymn stir in your heart? How does music add to Advent for you? This was a favorite carol of mine, but I haven’t heard it for years. Reading your post was like running onto a dear old friend, Jean. Thank you so much … I do believe I’m going to do a re-read eight now. I know just what you mean – I loved this hymn but hadn’t heard it much and since I”ve written this post – I have heard it twice! peaceful music and lovely words, aren’t they? Blessings on your Christmas, Linda! Oh, yes, Jean, rich or poor, we can all give our hearts to Jesus. And that’s the gift He wants most from us, isn’t it? This is an absolutely gorgeous hymn. I’m so glad you shared it here along with a short bio of Rossetti. Knowing the background can make something come to life even more. I keep hearing this hymn now all over. Lovely, isn’t it?